Whenever I really get into a new game I usually create a background image for myself to display on a second monitor. I add information I'd often reference while playing. I did the same for TerraTech and decided to share it with the community. I opted for the typical, modern low-end of monitor resolutions (HD 1920x1080) so that it would fit on almost anyone's second screen. If you're adept with image editing software, such as Photoshop or GIMP, you can of course add my charts into your own desktop background since I'm releasing them with individual layers for each component as a PSD (Photoshop) file. To grab the latest version, please visit the Github page for this mini-project. Or grab the PSD file here. A big thanks to ZeroGravitas for his earlier work on documenting crafting and Baconus_Yum for his image updates on the Wiki. And thanks to harpo99999 for his suggestions to include resource/component sell prices, and Matt for making the thread a sticky. 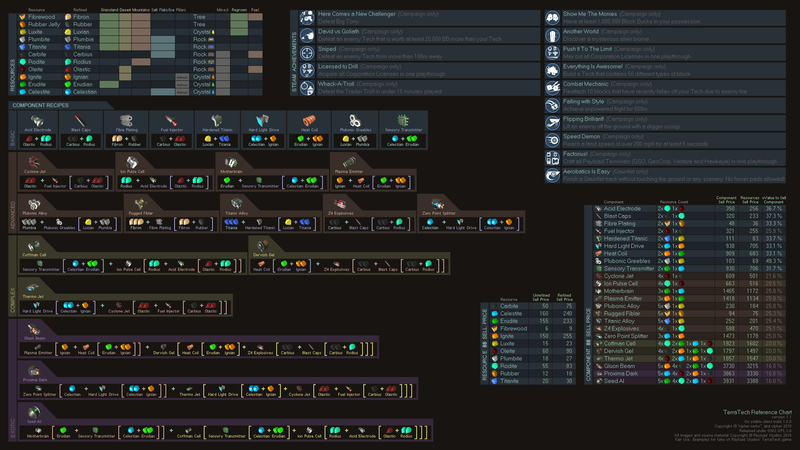 I'd love feedback and to get ideas on other TerraTech reference information you'd like added to the chart. If desired, I can also release it at multiple resolutions when I add more data over time. And perhaps if there's enough interest I can even create a quick app or webapp that serves a similar purpose, but with interactive help for both new and veteran players. Good idea, thanks! The wiki has good info on these prices, as well as a nice profit percentage if you craft components to sell instead of just selling the raw resources. So I'll include this in the next version. I'd love feedback on whether you think this is worthwhile or not. Thanks! This is ridiculous amount of effort to present this info in this way I salute you for it. LOL, it took some time indeed. But copying and pasting in Photoshop with layers helps make it less tedious. It's all pixel perfect too. Thanks for noticing. It's what happens when you're a compulsive perfectionist... but at least not OCD! All of the other crafting guides/charts out there only have work flows of components. I wanted one with a complete breakdown of the resources required for exotic and complex components. I'll be updating this soon with sell prices of resources/components as suggested by harpo99999 as well. Since this is stickied, I'll also attach the JPEG/PSD to the OP if the attachment system accepts those files/file sizes. I updated this and released version 1.1 with the sell price charts. Thanks! Yeah, they're both bigger. So I changed the thumb in the OP to the actual JPEG image file, and linked the PSD directly. The project is still linked as well. FYI for an image like that with large areas of flat colour you'll get much better compression with a PNG, and it'll be lossless too so no artifacts. SadKen, indeed, the PNG is smaller in size for fewer colors and more same-color surfaces. I actually prefer PNG when working with graphics since it's lossless. But this is meant to be used as a desktop background (old school: wallpaper) for Windows. Windows has a nasty habit of compressing any image files it uses as a background. So that's not normally a problem, but when you rely upon Windows to do the compression for you, it screws up color matching sometimes in PNGs because Windows uses JPEG compression. Windows does a much better job with color accuracy when it compresses JPEGs than when it compresses PNGs. And I always save these JPEGs at level quality 12 in Photoshop, which is pretty much no compression. A good test is to create a JPEG and a PNG with colors that are similar, yet slightly off in value. The JPEG when used as a desktop background will show accurately, while the PNG when used as a desktop background will have their colors skewed. When you're giving Windows a JPEG to use as a desktop background, it's already in the right file format and won't go through a format change like a PNG would. It appears Windows 10 is different, in that it doesn't compress PNG files, where as Windows 7 does. I use Windows 7 at home, so I always run into the compression issue of PNGs for desktop backgrounds. As for Windows 8/8.1, I have no clue if it mimics Windows 7 or 10 more with its desktop background conversion/compression. Fair points - I'm on Win10 so the PNG works fine as a background and fits within the 1MB upload limit. I'm not sure how I missed this thread... Awesome graphic. Will you post it to Steam too? Guides and/or artworks sections? I think it will reach more players there. Also, you component sell price table is really nice, for seeing at a glance what resources are needed, in total, for each component. @HAL actually posted a spreadsheet that will list the basic resources for each block, too, come to think of it, but you have to query it. ... But anyway, your resource sell prices (and "+Value") numbers appear to be for selling the sub-components one tier below, rather than the basic level resources you show to the left. As you go to higher end components, the mark up should be greater - e.g. for the Exotic Components it should be around ~100% more than just the refined resources, I believe. I'm not sure whether you'd want to show value increase over raw or refined, but it should probably correspond to the chunks illustrated in that row, to be clear what it's showing. Thanks! I'll make that adjustment soon. I took much of the data from the Wiki, so if that's off, then my data would be off. If you (or anyone else?) would like to type up the correct data, I'd be happy to include it. The sell price should be for the final component, not individual components within the recipe. I did re-calculate the increase over just selling resources, in order to get a more accurate percentage. But I'm still using the component sell price from the Wiki. So again, if anyone wants to give me the correct data for component sell prices, I'd be happy to update the graphic. But I'm still using the component sell price from the Wiki. Ah, right, from this page. Yeah, the "sell price of ingredients" would be, for Seed AI, for example, the total sell price of a Mother brain and Coffman Cell. It's interesting to show those numbers, but probably far more relevant to show the sell price of refined resource chunks that actually go into making all of those sub-components. e.g. 5*233 + 4*83 + 2*240 + 90 = 2067 (so a 90.2% total markup). I was going to link @Potato's old spread sheet which has all these numbers on, but it's numbers don't look quite right and it's a little hard to interpret... Easy enough to just add up the resource prices, from scratch, as I've done above (making a little new spreadsheet or whatever). Thanks. Someday I might go in and actually confirm all of these prices and update it. And I see what you mean now of the refined resources vs the components themselves. I think the wiki listed the price comparison of the component selling price to crafting the new component tier as opposed to the total refined resources sell value to the final component craft value. I'll definitely go in and fix that, hopefully this month. Thanks. And when that's done, I'll take your suggestion and put it up to Steam as well. I might go in and actually confirm all of these prices and update it. Most the higher level ones were a little wrong. So I've corrected them on the Wiki page. @AstraTheDragon, @Baconus_Yum - I've not recalculated the "Sell price of ingredients" (my head was spinning a little from all the numbers as it was ), so if someone could finish that up for me, that'd be great (checking the percentage markups too). And if there was another column added for total markup over resorce level ingredients, that'd be a bonus. I made a save file with all the components in, if anyone wants to check first hand (attached). @HAL's spreadsheet was closer to being accurate, with only the fuel injectors wrong. That's awesome! Thanks for doing that. I'll update the graphic soon to reflect these changes. Thanks for the heads-up, I'll have a look through the page now.